This is where you will find the information you will need to prepare for your Queensland motorcycle learner permit test. Once you book in you will receive a copy of the Queensland Motorcycle Riders Guide. A thorough read through this book will also brush you up on the road rules in general, and that's not a bad thing either. Queensland Transport also have an online service where you can practice your motorcycle road rule knowledge prior to actually sitting for the test. NOTE: Be advised that these are not the only questions that may be asked. Ensure you do your research before you sit your knowledge test..
How must a motorbike that does not have a sidecar attached be parked? Does the holder of a P1 or P2 type provisional motorbike licence have to display a P plate when riding a motorbike on a road? Is a motorbike passenger required to wear a safety helmet? NOTE: You need to have held a driver’s license for more than 12 months before you are eligible to get a motorcycle learner permit. Need a Learner Permit ? 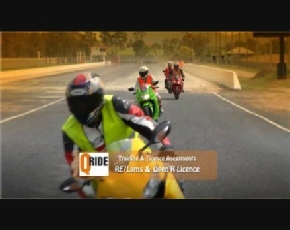 Go directly to the Qride booking page to book your course in Mackay. Get some practice and all the info for the motorcycle Learner Permit test..
Learner Approved Motorcycle (LAM) List 2012 .